We went to number seven Junipero Serra Branch Library the other day, which is near The Natural History Museum of Los Angeles County (the 31st annual Bug Fair is this weekend! ), USC and the Southern California Library. We were welcomed by a big Jacaranda tree. These purple flowers are covering Los Angeles right now. I think Los Angeles is beautiful this time of year. Even Riley picked out a book with some flowers on the cover. . . Counting With Frida/Contando Con Frida by Patty Rodriguez and Ariana Stein. It’s a pretty board book with numbers and words in Spanish and English. Another board book we brought home was One Naked Baby Counting To Ten And Back Again by Maggie Smith. I guess we’re on a roll with counting books. 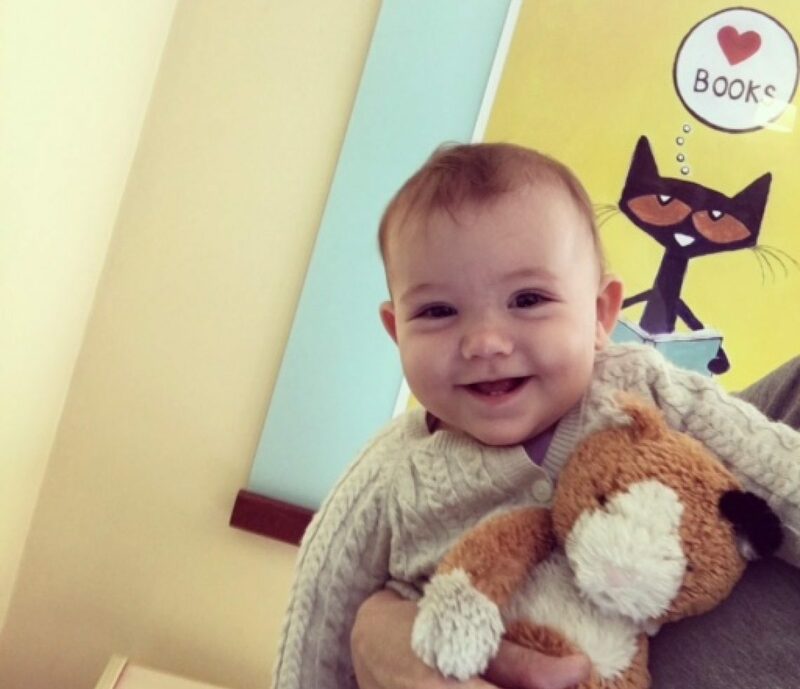 And baby books – since we also got Baby Face A Book of Love for Baby by Cynthia Rylant and Illustrated by Diane Goode. Baby Face has great rhymes! Maybe Riley knows she’s growing out of being a baby and graduating into toddler territory. She is starting to walk around the house and the libraries! In Plain Sight by Richard Jackson and Illustrated by Jerry Pinkney was a truly wonderful find. It’s a story about a girl and her grandfather. We have already read it multiple times. 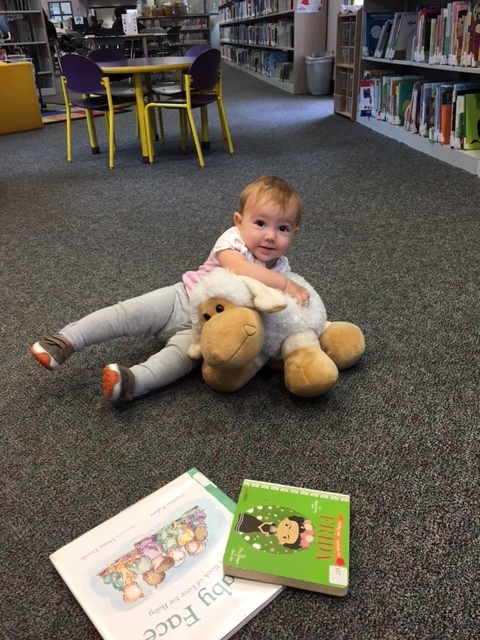 The library had giant plush animals above the children’s bookshelves – and these stuffed animals gained the attention of Riley. She really wanted the sheep. So, she borrowed it for a bit. She tried walking with it, but the sheep was rather large. A book that dealt with sizes, big and small, was Marta! Big & Small by Jen Arena and Illustrated by Angela Dominguez. It’s a very sweet book about a little girl and animals, with English and Spanish words. A highlight of our visit was meeting Andres, the Literacy Coordinator in the Literacy Center. Literacy Centers are just another great part of the Los Angeles Public Library system. I saw the best poster in there — Discover the Wonders of Reading, featuring Wonder Woman. . . a movie that is opening soon (to the glee of many of us). And movies of course, usually start as a book. As I’ve seen in many of the other libraries we’ve visited, there were L.A. Made posters, giving information about the cultural series featuring free music, dance, theater with local entertainers at libraries throughout Los Angeles through November 2017. You never know what wonders you will find in (and near) your local public library! I learn something new at each branch we visit.